Called "archetypal and stirring" by Deepak Chopra, The Immortals of Meluha heralds an exciting new wave of fantasy writing inspired by the ancient civilizations of the East. Tripathi devoted years to the research of Hindu mythological stories and history, and discussions with his family about the destiny of the human body, mind and soul to create this sweeping and fascinating adaptation of ancient Hindu mythology for modern fantasy readers. 1900 BC in what modern Indians call the Indus Valley Civilization and the inhabitants called the land of Meluha: a near-perfect empire created many centuries earlier by Lord Ram one of the greatest monarchs that ever lived--faces peril as its primary river, the Saraswati, is slowly drying to exctinction. The Suryavanshi rulers are challenged with devastating terrorist attacks from the east, the land of the Chandravanshis. To make matters worse, the Chandravanshis appear to have allied with the Nagas, an ostracized and sinister race of deformed humans with astonishing martial skills. The only hope for the Suryavanshis is an ancient legend: When evil reaches epic proportions, when all seems lost, a hero will emerge. Is the unexpected, rough-hewn Tibetan immigrant Shiva that hero? Drawn suddenly to his destiny, duty, and by love, Shiva will attempt to move mountains and lead the Suryavanshi to destroy evil. An intense story 'The Immortals of Meluha' draws heavily from stories and legends of Hindu mythology that have been passed on from generation to generation. 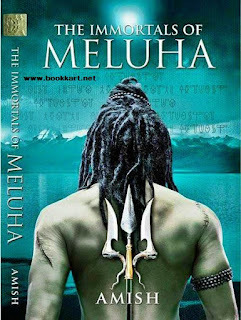 First book of the trilogy, the Immortals tale unfolds in Meluha, a land that is ruled by the Suryavanshi tribe that firmly believes in the prophecy of 'Neelkanth' Shiva being their saviour. The Suryavanshi’s (Sun worshipers) are of the firm belief that it would be Shiva who would save them from the wrath of Chandravanshi’s (Moon worshipers). As the tribal leader of Meluha, somewhere in Tibet, Shiva decides to help the Suryavanshi's in their fight against the Chandravanshi, who have allied with the Nagas, a cursed tribe. The author has creatively woven the legend of Lord Shiva; His marriage to King Daksha's daughter Sati is this first part of the trilogy. 'Secret of Nagas' and 'Oath of the Vayuputras' the second and third part of the same narrative take the story forward as the first part ends with Shiva charging to save Sati from being taken captive by the Naga's. Spread out in 415 pages, 'The Immortals of Meluha' was first published in 2011. After a slow start, the book soon turned a bestseller and more than two million copies have been sold. Till date it has been translated in fourteen languages. Amish Tripathi, an IIM Calcutta graduate, gave up a successful bankers’ job of fourteen years to pursue his passion for writing. Born and brought up under Hindu traditions, the writer draws inspiration from the legend of Lord Shiva, something that he has famously woven into a bestselling fantasy fiction trilogy. As an author of best sellers, Forbes India has even included him among the top hundred celebrities of India.